The EUR/USD currency pair keeps moving downwards. 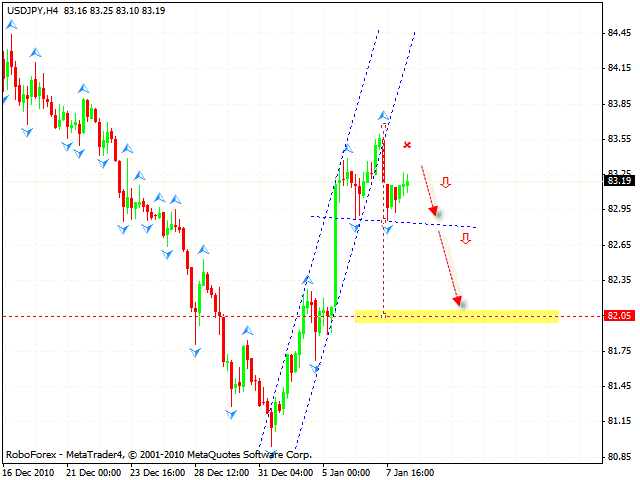 At the moment there is a possibility of the formation of the descending pattern with the target in the area of 1.2660. After the price reaches the level of 1.2700 we should expect it to be corrected into the area of 1.3000 (the channel’s upper border) and then the final downward movement. To determine a longer term scenario of Dollar movement, let’s take a look at the Dollar Index. At the weekly chart we have the pattern of the technical analysis, “triangle”, forming. 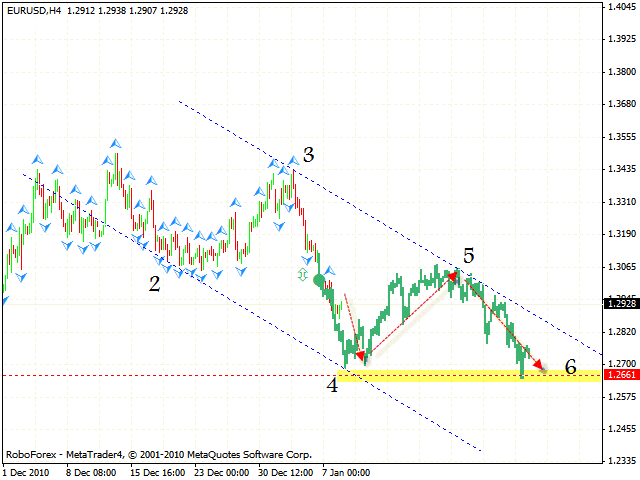 The price hit the pattern’s lower border and is expected to go up to the upper border and break it. 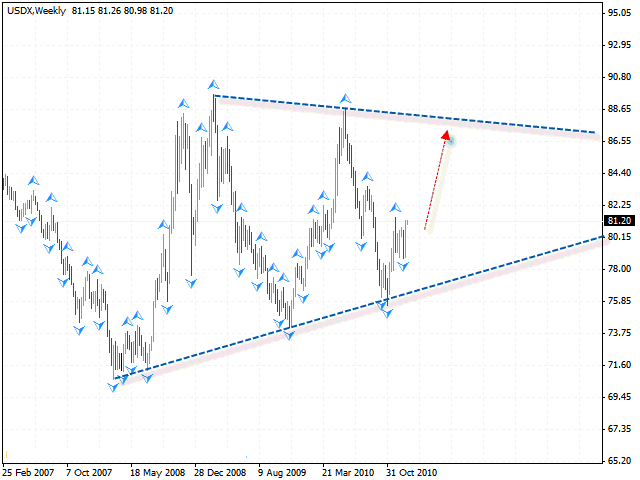 If it happens, we will see the development of the rising trend in favor of Dollar. The GBP/USD currency pair keeps moving within the defined range. At the moment one can consider the tight stop sales of the pair. 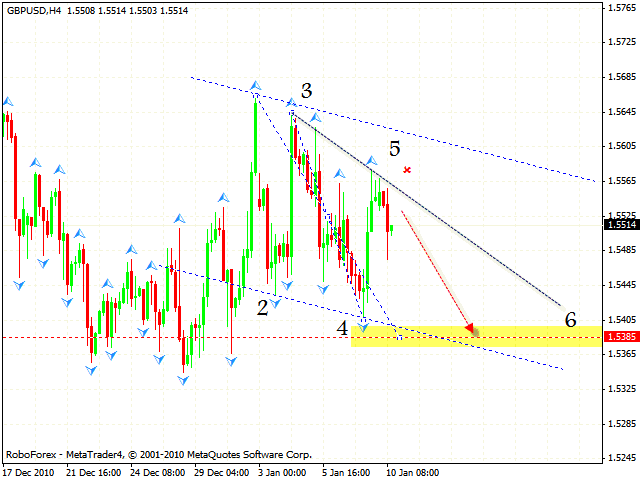 The target of the fall is the area of 1.5385, the stop must be above 1.5565. At the H4 chart we can see the formation of the “failure swing” reversal pattern with the target in the area of 1.4860 at the RSI. However, if the price breaks this level, it will result in a complete formation of the “double top” pattern with the target of 1.4667. 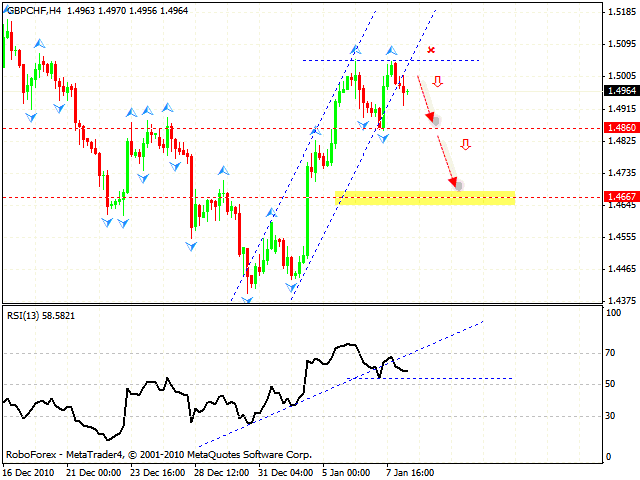 One can consider selling the pair with the stop above 1.5060 even now. At the hourly chart of the USD/JPY currency pair we have “head & shoulders” reversal pattern forming with the target in the area of 82.05. One can either start the tight stop sales even now, or wait until the neckline is broken. 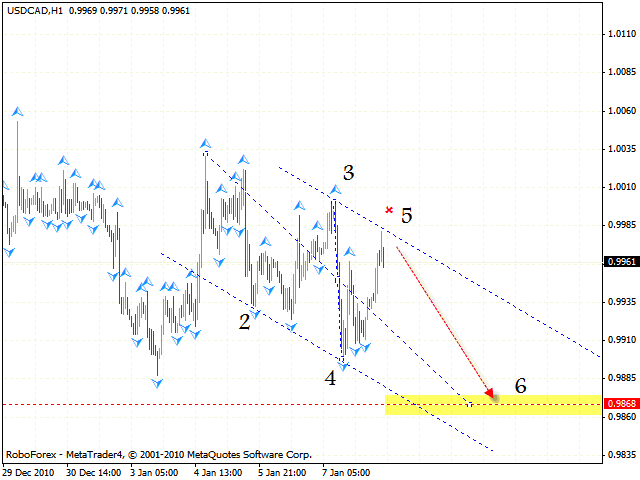 The USD/CAD keeps moving inside the descending channel, one can try to sell it with the target on the area of 0.9868. The stop must be above 0.9985, and don’t forget to move stop into the black as soon as possible. 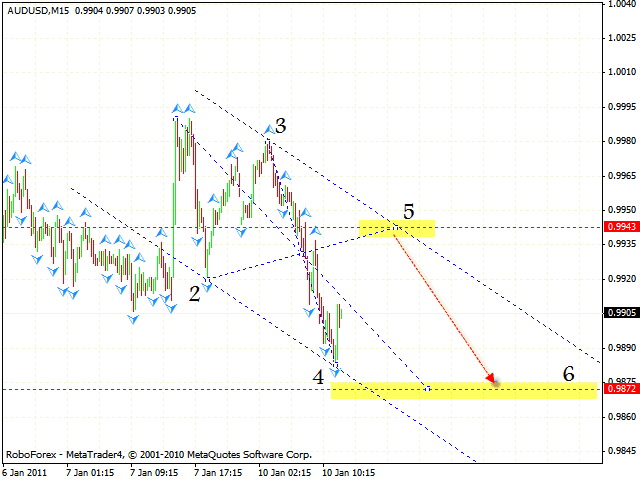 In case of Australian Dollar we have a similar pattern forming. At the moment the pair is in the area where the 4th point of reference is formed. We can expect the pair to grow from this area to the level of 0.9943, and a following final downward movement to the area of 0.9872. One is not recommended to buy the pair, but can try to sell it instead.